NASA still has not met three of the 15 recommendations to return a shuttle to space following the Columbia disaster, but a task group overseeing the effort said Wednesday it hopes to complete its work in time for a July launch. Before NASA sends the shuttle Discovery into orbit, it must eliminate all sources of potential debris from the external fuel tank and finish hardening the shuttle's exterior, the Return to Flight Task Group said Wednesday. The third recommendation asks the agency to develop a definition for damage that could pose an unacceptable hazard and develop repair techniques that could be done in space to fix tile and carbon panel damage. Task force member Col. James Adamson said NASA is nearing launch readiness. He added that development of repair techniques won't block Discovery's launch, unlike the other two open recommendations. Task group members said they cannot complete the remaining recommendations until the group takes another look at data provided by NASA and additional information yet to come. The group completed work on five recommendations Wednesday, including NASA's adoption of a safe flight schedule and certifications for mission managers. A 1.67 - pound piece of foam from the external tank brought down Columbia after it struck the ship's left wing at more than 500 mph shortly after liftoff in 2003. The damage allowed searing gases into the wing two weeks later during re-entry, and the spacecraft broke apart over Texas, killing all seven aboard. 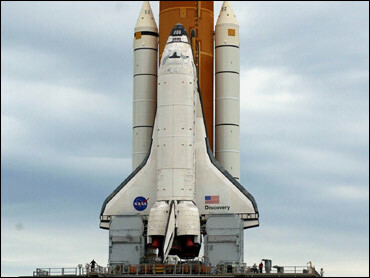 The nation's three remaining space shuttles have been grounded since then.